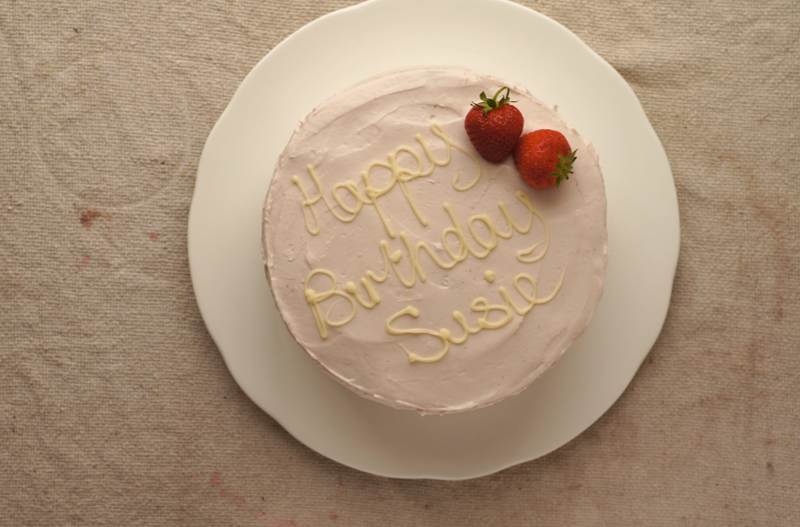 My mum's friend Mary (of blueberry loaf cake with mint and lemon fame) also had some on the day and as a result decided to ask me to make one for her friend Susie's birthday. So I made it again this weekend and this time it really was a birthday cake. Incoherant birthday rambling aside, this is a great summer cake. The featherlight sponges are split, brushed with vanilla syrup, soaked with some strawberry puree, smeared with softly whipped cream and finally topped with thinly sliced fresh strawberries. The icing on top is amazing (if I do say so myself) - marscarpone, a bit of icing sugar and some more lovely strawberry puree. The first time around I folded in some extra whipped cream but, as you can see from the photo above, it made it a bit too thin. Either way it's pale pink and utterly addictive. 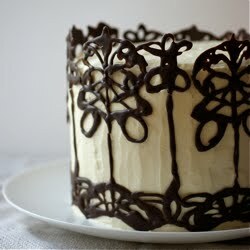 So, birthday or not, I think you should make this cake soon. Wash and dry the berries. Remove the stems and place into a food processor or blender. Blend until it is as smooth as possible. Strain through a fine mesh sieve into a bowl to remove the seeds. Beat the marscarpone with a spoon in a medium sized bowl until smooth. Add the icing sugar and beat until combined. Add the strawberry puree in four batches, beating to combine between each addition. Put into the fridge to chill and set a bit while you make the sponges etc. Preheat the oven to 180C/350F. Grease and line two 7" tins (or 6" - I used these the first time). Sift the flour, cornflour, baking powder and salt together three times. Place the yolks and water in bowl of a stand mixer and whip on high for 1 minute. Add the sugar and whip for 5 minutes - by then the mixture should be pale, fluffy and leave a trail when the whisk is lifted out that is visible for at least 5 seconds. Add the vanilla and whip for a few seconds to combine. Transfer the mixture to another bowl (unless you have two stand mixer bowls) and wash the bowl up, drying it carefully. Whip the egg whites in the mixer to stiff peaks. Place the yolk mix bowl on a damp cloth to stop it moving. Sift 1/3 of the flour over the yolk mix, then fold it in carefully (see here for technique). Add and then fold in 1/3 of the egg whites. Repeat, folding 1/3 flour, 1/3 whites, 1/3 flour, 1/3 whites until they are all combined. Quickly and gently transfer the mixture to the two tins, level out and put in the oven. Bake for about 20-25 minutes - a skewer should come out clean from the middle of the cake and it should spring back from a touch. Immediately slide a knife around the edge of each cake so that it shrinks evenly. Leave to cool in the tin for 5 minutes then remove to the rack and peel off the paper. While the sponges are baking, place the water and sugar into a small saucepan. Scrape the seeds out of the pod and add both the seeds and pod to the pan. Heat over a medium heat until the sugar has fully dissolved. Leave to steep until needed. Whip the double cream until it holds soft peaks. Split the cool sponges into two with a serrated knife. Cut the strawberries into thin slices of about 1/2 cm. Cover the serving plate with four strips of baking parchment and then set one sponge circle on top. Brush 1/4 of the syrup over the sponge. Spoon over about 2-3 tbsp of strawberry puree, spreading it out as you go. Spread a 1/3 of the whipped cream over the top, leaving a small space around the edge. Arrange 1/3 of the strawberry slices over the cream in a single layer. Add the next sponge circle and press it down lightly. Repeat the syrup, puree, cream and strawberries for this circle and the next. Finally add the last layer and brush over the last 1/4 of the syrup. If you like, cut a wooden skewer to size and use as a dowel to keep everything in place. Use about 1/3 of the icing to create a crumb coat, concentrating on filling any gaps on the sides between layers. Chill for 30 minutes. Finally smooth over the rest of the icing and add any decoration - I piped whipped cream dots on the first, then wrote on the second with white chocolate. 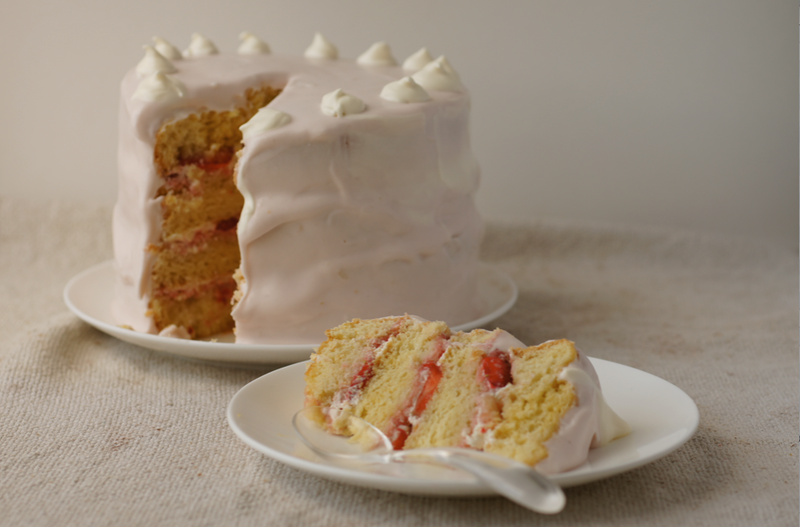 This cake doesn't keep very well, as the strawberries and fresh whipped cream don't hold well (or the cake next to all that moisture) - so it's best to prepare it as near to the time you want to eat it as possible. Yum... strawberries for summer, this looks so good. 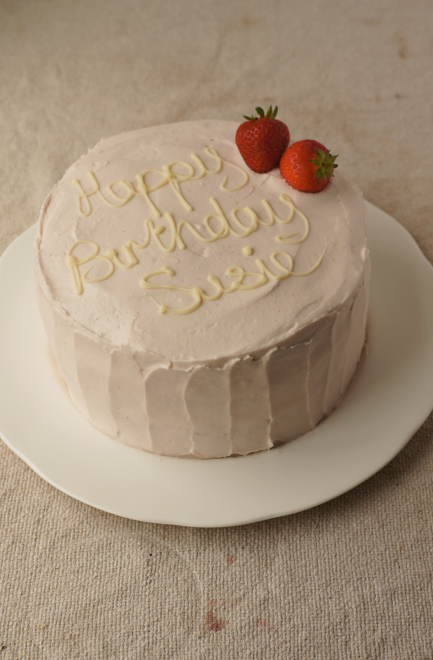 You've lavished so much care and attention on this gorgeous cake - lucky friend. It looks heavenly and delicious, the double whammy. I find your blog very inspirational, it was one of the ones that inspired me to start my own recently www.idlebakes.blogspot.com (my cakes are very different from yours though as I'm a novice baking traditional country cakes from our home grown devon produce). Well done for making it through the finals, and I hope life feels more settled for you soon, a professional patisserie future awaits I bet. Harriet - Strawberries are perfect for summer, aren't they. I've really enjoyed them this year. Emalina - Thank you! I'm so glad you've found it inspirational. Your blog looks great. Hello I would like to bake a strawberry sponge cake this evening but have a question!! In Ready for Dessert David Lebovitz doesn't use cornflour for his sponge, do you think it is better with? Or without? Hi Maria - David's recipe specifies cake flour so as we don't get cake flour in the UK (as far as I know) I used Joy's instructions (http://www.joythebaker.com/blog/2009/09/how-to-make-cake-flour/) to sub in the cornflour (cornstarch in US terms) to make cake flour. Hope that helps and enjoy the cake! If you wanted to to make this cake as 9 inch cake would you double the recipe? The cake looks like a light sponge that my mum wants for her birthday! Babs - I think a double recipe would be good in two 9" tins, yes - it might need another 5 mins or so to bake. Hope you enjoy! Absolutely amazing recipe - so impressed! Any suggestions how I could make a coconut syrup instead of vanilla? Thanks for the recipe and inspiration! Everyone loved this cake. Do you mixes the icing and the whipcream together? Also can you make the cake a day before? The whipped cream is to put in between the cake layers (with a bit of puree, fresh fruit and vanilla syrup) and the icing is to go on the outside. I would't make it the day before - it might go a bit soggy and the fresh strawberries don't keep well inside. Hope that helps! This looks absolutely delicious. Can I make the cake the day before? Hi Jeanne. 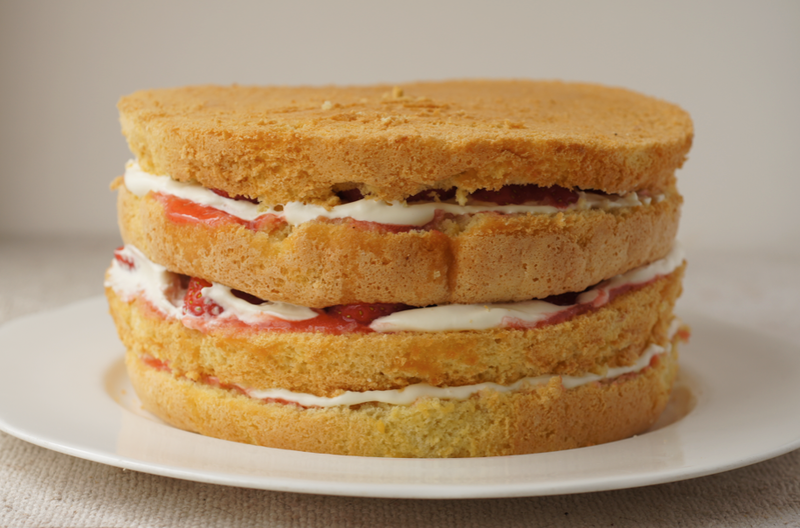 Sadly this cake doesn't keep brilliantly - the strawberries in particular go a bit soggy and the cream is best fresh, as is the sponge. So I wouldn't recommend making it the day before!